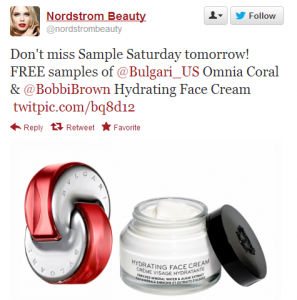 Free Bobbi Brown Face Cream & Bugari Omnia Coral @ Nordstrom- 12/29!! Stop by your local Nordstrom on 12/29 to pick up FREE samples of Bobbi Brown hydrating face cream and Bulgari Omnia Coral! No coupon required and no purchase necessary.